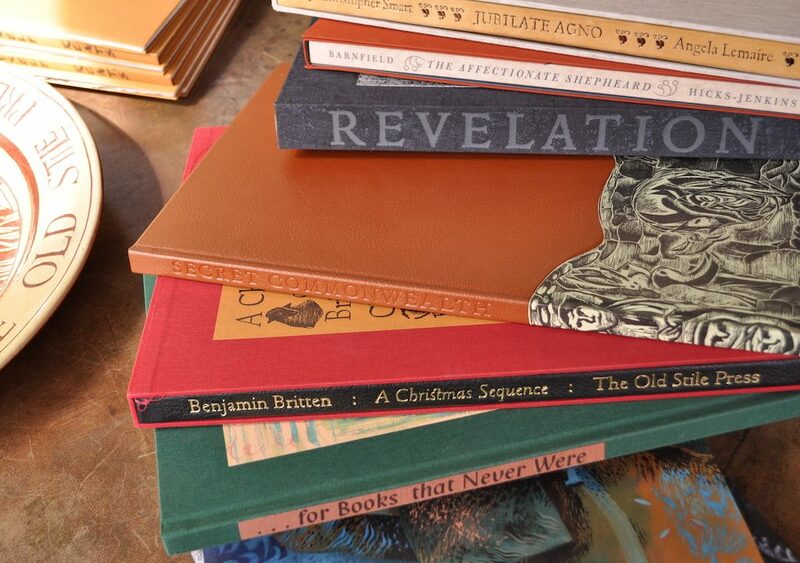 We are often asked about where we sell our books and what sort of people buy them – sometimes I think just on a point of interest but at other times we get the feeling that people like to think they are in good company buying something hand made by a tiny press working in idyllic surroundings. 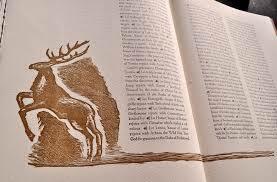 Can they really be collectors’ items recognised by enthusiasts in the world of rare books? Perhaps for reassurance about their judgement of the quality of the book they are choosing, perhaps delight in knowing who else enjoys such books. It can be especially difficult to feel confident in choices if you can only see the images online and you are far across the world – but all these people have happily taken the plunge! 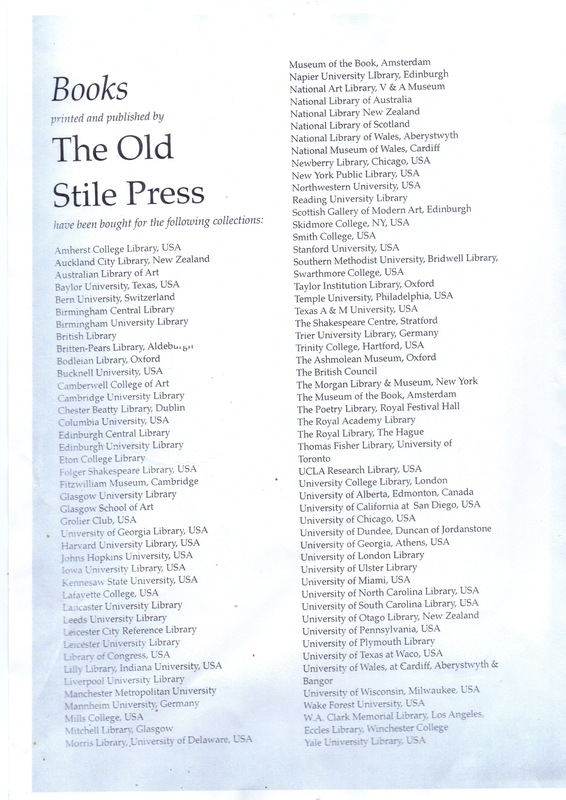 We are made to feel very proud by this long list of major libraries worldwide who have bought copies of our books. Many of them buy regularly, indeed a few buy everything we do. When I first asked the computer to bring up such a list we were dumbfounded and deeply honoured to feel that there are so many rare book departments who have desired the books. Over the years I have visited a number of dimly lit rooms filled with all those books from presses which we revered and emulated when we started to print books for ourselves. 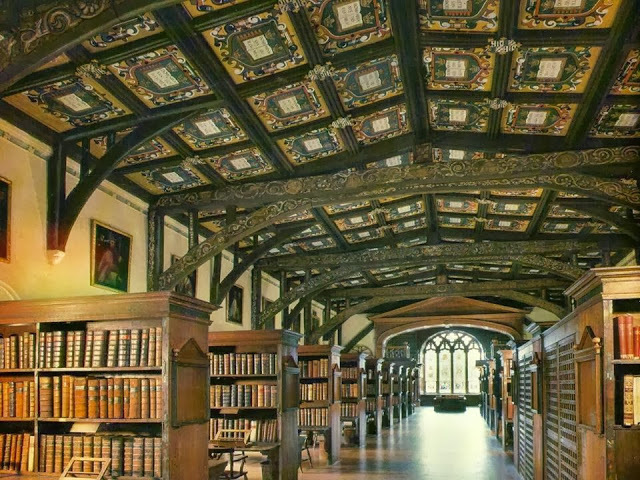 There was an especially exciting day when there was a reception in Duke Humfrey’s Library in the Bodleian to encourage Friends to sponsor particular acquisitions. Among these was our tribute to the Gutenberg Bible which we had had the privilege of being allowed to handle on our visit to the Eton College Library. The excitement of that experience had demanded that we produce a book to honour the day. We chose the text of Christopher Smart’s Jubilate Agno and created the two column design with illuminations by Angela Lemaire. Another question we are often asked is ‘have we had exhibitions of all our books in major galleries or libraries’? Indeed we have had a number over our 35 years of printing and publishing. There have been two in which we were able to exhibit not only the books but some of the prints, paintings, drawings and sculptures by the artists we have worked with which gave an indication of how important it is for us to work with artists whose work we enjoy.The museum in Brecon was one such where it was possible for a measure of our history as well to be shown together with the mediums of woodcut, wood engraving and linocut and some explanation of photopolymer. 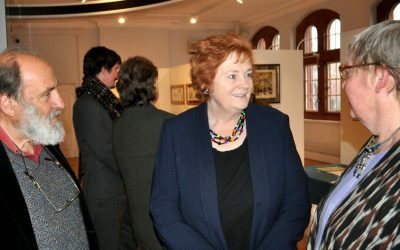 We were also invited by Dame Rosemary Butler, then the Presiding Officer of the Senedd or Welsh Assembly, to show at the prestigious Pierhead Building on the riverfront in Cardiff and were able to mount a similar show which was seen by something like 7000 people with considerable enthusiasm. Eton College had a really delightful exhibition in their Library of twentieth century private presses in which they gave us a large display case to ourselves. 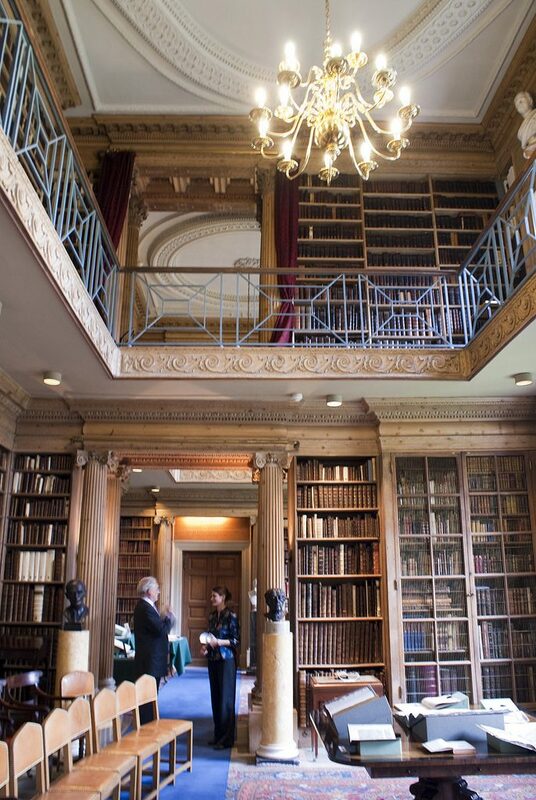 As it is one of the most historic and venerable libraries in the country, that gave us a great thrill. 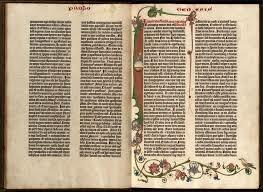 This was also the occasion when we were handed their copy of the Gutenberg Bible to turn its pages and study the printing at close quarters – overwhelming! More locally, a really beautiful gallery in Abergavenny – The Art Shop – exhibited two rooms full of our books in a display which attracted a good deal of attention. Monmouth Museum has also shown them but cutbacks reduce this ability to do such things now. Then there was a display where people could sit and look at all the books during the Crickhowell Literary Festival . 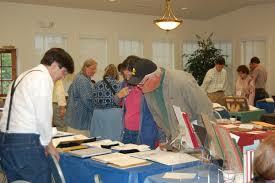 . .
Fairs are another source of ‘exposure’ and I have been to many of those! Every two years there is a Fine Press Book Fair in Oxford which is probably the one that focusses most on hand-printed books from presses working independently. Then the London Art Book Fairs which began in the Royal Festival Hall and moved to various locations but has now been swallowed up by the Whitechapel Gallery show which has a different slant on such books. Works on Paper also has moved about from Burlington House, to Covent Garden, to the Science Museum and now to the Royal Geographical Society. We have been a presence there for many years. The International Antiquarian Book Fair, now at Olympia, is probably the biggest and most prestigious which we go to nowadays. It has always the most extraordinary display of historic and priceless books and we always feel humbled to be among them and yet still receive considerable praise and enthusiasm! 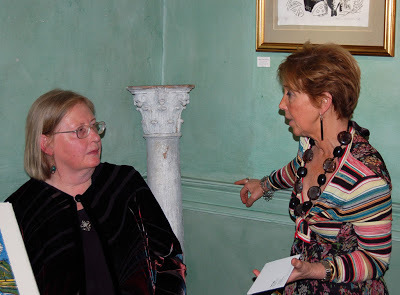 For many years I used to go to Oak Knoll Fest – a bookshop run by the Fleck family in Delaware. 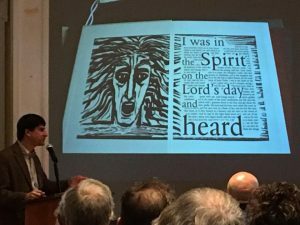 They mounted a remarkable weekend fair and series of talks and discussions which attracted rare book collectors and librarians from all over the US and where OSP books were always well received (by which I mean lots sold!) Recently I have been unable to travel there, nor indeed to CODEX in Berkeley, US, a show which I attended the inaugural weekend but not subsequently – sadly given that it appears to have gone from strength to strength. 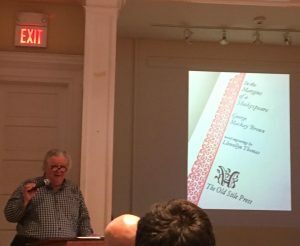 From the most recent of the seminars held at Oak Knoll, I was delighted to have been sent images of two of the speakers talking about our books in spite of our absence – really wonderful to see. Mark Dimunation of the Library of Congress and Ron Patkus from Vassar College. Mark Dimunation of the LIbrary of Congress speaking at Oak Knoll. Since we first began to find markets, buyers, collectors and bookshops have diminished in number but the internet has made all sorts of different things possible. We have had a website for 17 years and recently it was modernised to make it compatible with many new aspects of the technology. This makes us visible to all sorts of new people which is a delight and we hope this will expand. We have one small (?) difficulty in that Amazon automatically lists our books (from the British Library listing) but then they insist on stating that they are unavailable – something which we find an affront to fair trading. It is always worth looking on our own site to see if copies still exist for sale. Clive Hicks-Jenkins at the National Library of Wales had a spectacular show of paintings and display cases with the books he has done with us. Earlier in the NLW John Elwyn’s Houses of Leaves featured alongside his 8oth birthday retrospective. Angela Lemaire has shown paintings, prints and books in Edinburgh bookshops; Glenys Cour has just had a stunning show in the Glynn Vivian Museum in Swansea with her books on display and for sale; Ralph Kiggell has shown books and stupendous prints in galleries in Bangkok (where he lives) and in China and Hong Kong. 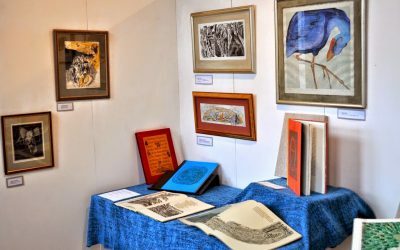 Robert Macdonald displays prints and books together in numerous surroundings; Mark Cazalet too has books alongside paintings and prints . . . and so it goes on. All very exciting. Let us hope you can encounter our books in one of these ways and enjoy sharing the company of so many collectors.